Casey and Associates, Inc., has been serving the Railroad Industry since 1996. We have a highly talented team of independent sales representatives promoting locomotive rebuild sales, service and leasing. 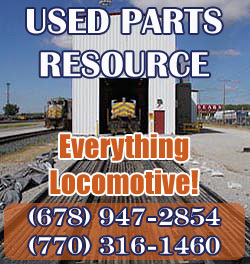 Other services include locomotive component repair, unit exchange components, new parts and availability of running take outs (RTO) or rebuildable core material. CAI represents quality locomotive rebuilders and component manufacturers, such as; Norfolk Southern Corporation (TMS), including, Power Systems International, and Infinitive, Truck Electric Company, Curry Supply, Magnetech Industrial Services, Inc., and LinkUp International. Our Mission: Focus all efforts and resources to exceed the expectations of our customers and principals through our commitment to product quality. M. Wayne Casey has 42 years experience in the Railroad Industry. In 10 years with Electro-Motive Div. GMC he was Regional Warehouse Manager, Locomotive & Parts Sales Manager, and International Parts Sales Manager. For the next 10 years he was National Sales Manager for Triangle Engineered Products Company directing the sales of locomotive applied air compressors. Wayne has been the President of Casey and Associates, Inc., since it’s inception in 1996.